Hoolagators All American Diecast have been importing and selling American diecast model cars and racing apparel for 20 years. We only sell top quality diecast products from the USA and will always guarantee their quality and will back this up with the best Customer Service possible. 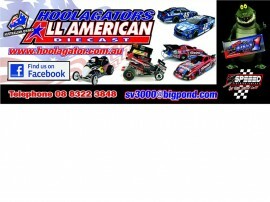 Hoolagators All American Diecast are Authorised Australian Dealers for ADC, ACME, GMP, Lionel, R&R Sprintcar Diecast Models. We distribute Brickel’s Racing Collectibles, JH Design Clothing, NHRA Top Fuel Dragsters, Funny Cars, Pro Stocks & NHRA Apparal, Lionel NASCAR models & Chase NASCAR Apparal, Greenlight & Muscle Car models.